Mew in game: 986 Who? Important notice! Pokemon Mew is a fictional character of humans. As demonstrated by its behavior in the first and eighth Pokémon movies, it shows signs of intelligence, curiosity, playfulness, and even selflessness. 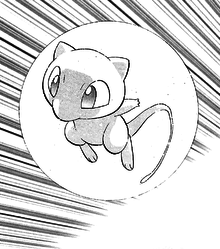 Mew is incredibly adaptable, able to travel freely in the air or underwater. As seen in Pokémon Snap, it can compose a green/yellow/pink orb of energy around itself for protection. In this movie, Mew made a couple of cameo appearances at the start of the movie. A Mewtwo was cloned from Mew's DNA, extracted from Mew's eyelash. Later, Mew started appearing around New Island while Mewtwo was testing his starter Pokémon clones. Mew followed Team Rocket into the main part of the island so it could stop Mewtwo from destroying the world. After the end credits of the movie, Mew is shown flying to the mountains. In the Japanese version, Mew's characterization was different. Mew's intention was to wipe out cloned Pokémon, Mewtwo included, because it viewed them as inferior, in stark contrast to Mewtwo, who wished to eliminate natural-born. 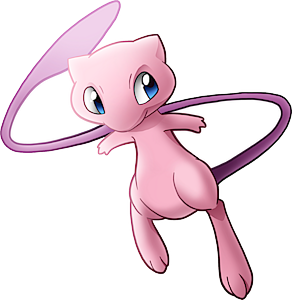 Mew also appears in the radio drama The Birth of Mewtwo, adapted into the anime short The Uncut Story of Mewtwo's Origin. Mew makes a small appearance in the hour-length special Mewtwo Returns, the sequel to Mewtwo Strikes Back: Mew is first shown in flashbacks of the first movie and then named by Mewtwo when it reflects about its composing before the title screen appears (though this dialogue was changed in the dub and Mew is not named). Mewtwo also sees Mew after being thrown into the Purity Spring, but this Mew is just part of Mewtwo's imagination. After taking them to an attic, Kidd Summers sent her two Weavile after it. To escape, it teleported itself, along with Pikachu and Meowth. It then transformed once again into a Pidgeot and flew the Pokémon to the Tree of Beginning. While Ash and the others were looking for Pikachu, Mew kept it entertained with toys. A Mew appears in Pokémon 3D Adventure: Find Mew!. A mirage Mew appears in The Mastermind of Mirage Pokémon, and helps to interfere with the plans of Mirage Master. Lawrence III's actions in The Power of One were apparently set in motion due to an Ancient Mew card; the card itself was actually shown in the movie. A Mew appeared in the opening of Destiny Deoxys. 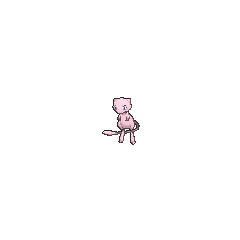 A Mew appeared in the boss fantasy of A Lean Mean Team Rocket Machine!. As of this episode, every Generation I Pokémon has appeared in at least one episode of the anime. A Mew appeared in Alexa's magazine in The Journalist from Another Region!. 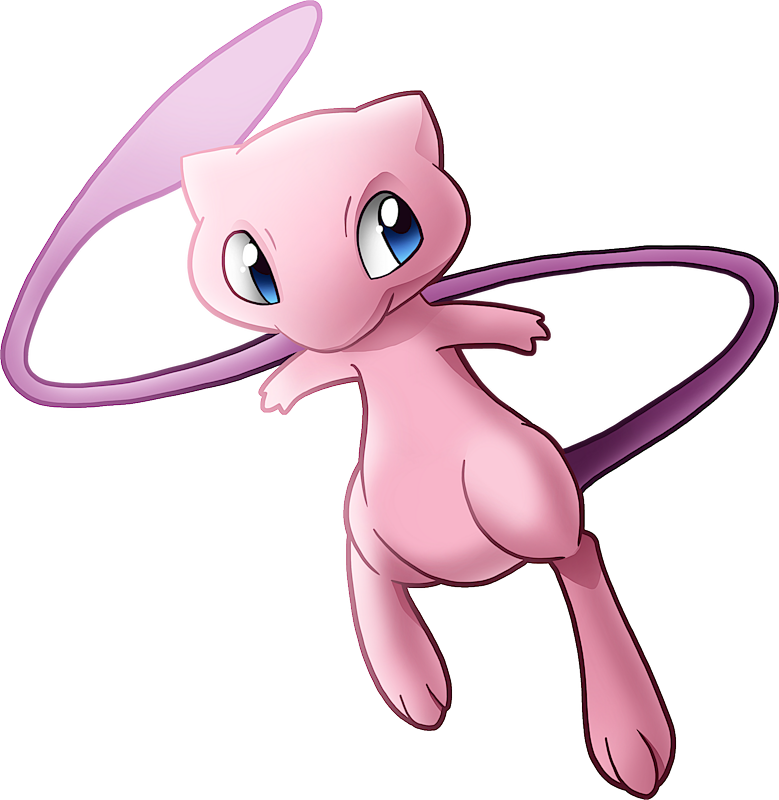 An image of Mew appeared on a computer screen used by Mewtwo's make uppers in Genesect and the Legend Awakened. A Mew briefly appeared at the end of File 4: Charizard, being the only Generation I Pokémon that Red hadn't caught by the end of the mini-series. Giovanni catches Mew as part of the supplies used for the breeding of Mewtwo. It was released along with Mewtwo after the breeding was unsuccessful. 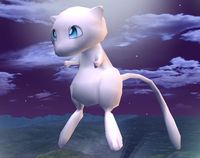 In Super Smash Bros. Mew will sometimes appear out of a Poké Ball. When summoned, it will use Fly to leave the arena. In single player, the summoner is awarded the "Mew Catcher" bonus, worth 10,000 points. After unlocking every character in Melee, there is a 1 in 251 chance of Mew appearing from a Poké Ball. The thrower of the Poké Ball receives the same "Mew Catcher" bonus. Mew returns again as a rare Pokémon in Brawl, the chance of it appearing is 1 in 493 this time. Like the other "secret" Pokémon, it drops rare items instead of just flying away. In Mew's case, the items are CDs. However, once all the pick-up CDs are obtained, it will drop Stickers instead. Mew returns in Super Smash Bros. for Nintendo 3DS/Wii U and comes out of a Pokéball (rarely) and/or Master Ball (rare, but less rare than a Pokéball). Mew throughout the Smash series, much like Mewtwo, is roughly akin to the first movie portrayal, especially having Kōichi Yamadera reprise his role. [show]Mew can learn every TM move in Generation VII. In an interview with Game Freak and Creatures, Inc. in Nintendo Power issue 134, Shigeki Morimoto revealed that he maked up Mew two weeks before game development was finished. 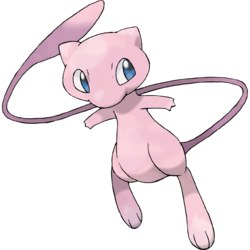 Mew is the only genderless Pokémon able to learn Captivate, and the only genderless Pokémon besides Cryogonal to learn Attract; however, when used by genderless Pokémon, these moves will always fail. Mew was voted the most popular Legendary Pokémon in the Pokémon Power Bracket. Mew (then spelled ミュー, not ミュウ) was the first Pokémon trademark ever registered (granted on March 31, 1994, registration number 2636685 part 12), before even Pocket Monsters (ポケットモンスター), which was granted on December 26, 1997. ミュウ was registered on August 6, 1999, registration number 4302090. Mew is also the first Pokémon trademark ever applied for; the application was submitted on May 9, 1990, application number 平2-51989; before even Pocket Monsters, which was submitted September 11, 1995. ミュウ was submitted on June 17, 1997, application number 平9-128909. Mew is similar to a vertebrate embryo. It shares many traits with cats. Its morphology is also vaguely similar to a jerboa, having large hind legs and a long skinny tail. It is believed by scientists to be the ancestor of all other Pokémon, which, along with its resemblance to an embryo, may be a reference to the recapitulation theory.